Organised by the Classic Rally Association (CRA), this year’s event will take drivers through amazing scenery and challenging roads. Guy Woodcock, Clerk of the Course in 2012 and regular competitor at CRA and HERO events, created the new route assisted by Anthony Preston, another regular competitor who has been involved with the organisation of many CRA rallies for many years. Following gripes from competitors in 2012, the event will contain much less ‘on the move’ plotting, have slightly shorter days to give more time for socialising and will include a descriptive route book for the link sections on the two evening runs. Yet traditional values will be maintained and the route will take crews through many of the historic locations of the 1950’s RAC rallies, including Chester and Harrogate, as well as new sites never used for rallying. Around 75 crews mainly from the UK and Europe have already signed up and only a small number of places are left. 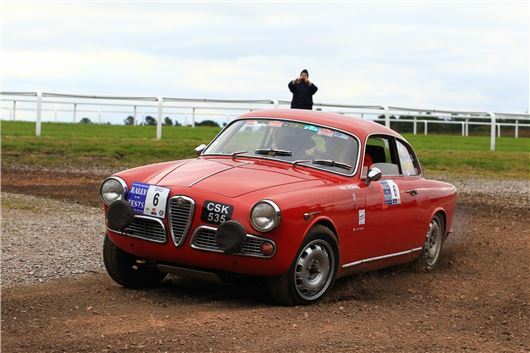 The rally is open to all cars manufactured before 1981 and the entries received so far include a 1960 Riley 1.5, a 1958 Alfa Romeo Giulietta Sprint (as per photo) and a 1954 Lancia Aurelia B20, amongst others. Crews will start from Chester on Thursday 31st October with some regularity tests. Then on 1st November, the rally starts in earnest as the route takes in classic rallying terrain, looping through North Wales to the first overnight halt in Stoke-on-Trent. Depending on the weather, Saturday 2nd November will see drivers heading north into Lancashire and Cumbria through the scenic but challenging roads of these traditional rally heartlands. The day will conclude with an evening road rally section before stopping for the night on the southern edge of the Lake District. More classic sections follow on Sunday as the event traces a new route east into the Yorkshire Dales. After a series of tests and regularities in the Vale of York, crews will make it to the finish line in the spa town of Harrogate on Sunday 3rd November, where many RAC rally winners have been welcomed in the past by cheering crowds. The Rally of the Tests is the fifth qualifying round of the much coveted 2013 HERO Cup, in association with EFG International. The club's annual championship sees crews participating in a sufficient number of events organised by HERO and the CRA along 2013, competing to win a week on board the 95 ft. S/Y Orianda cruising in the Mediterranean (www.orianda1937.com). The Classic Rally Association (CRA) is a classic car club recognized by the Royal Automobile Club Motor Sports Association (the MSA) - the official governing body for motor sport in the UK, affiliated to the FIA and, through its membership of the Federation of British Historic Vehicle Clubs, is affiliated to FIVA - the Fédération Internationale des Véhiculs Anciens. The CRA can trace its roots back to the Coronation Rally, which Jeremy Dickson co- established in 1983. This was the first club level historic event and five years later came the Pirelli Classic Marathon – widely recognised as being the starting point of international classic rally events.